This recipe could not be any easier to get together in your slow cooker. It starts with frozen boneless skinless chicken breasts right in the slow cooker. Then you add a bottle of your favorite brand of barbecue sauce on top of the chicken. Then the last ingredient is some canned canned pineapple chunks. And then, the whole thing is slow cooked for a few hours until the chicken is done. 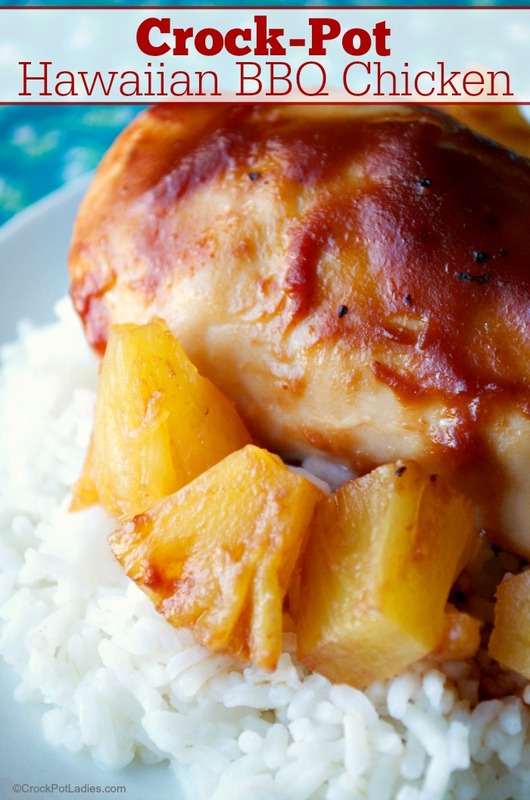 This is a sweet chicken dish from the bbq sauce and pineapple so it is best served with a couple of savory side dishes such as some cooked rice and vegetables. If you are needing to cut back on sugar there are some very good sugar free BBQ sauces available now that are worth trying. While our favorite store bought BBQ sauce is Sweet Baby Ray’s© (the flavor is the BEST!) our favorite sugar free BBQ sauce brand is G Hughes Smokehouse© which we have been able to find at Walmart (or on Amazon if you cannot find it local). For a sugar free sauce it is pretty darn tasty! With only three simple ingredients this recipe is both easy and super tasty! While we like Sweet Baby Ray's©, feel free to use your favorite brand of store bought bottled barbecue sauce! Place the frozen chicken breasts in a 4 to 6 quart slow cooker. Pour barbecue sauce over chicken, making sure the chicken is covered in the sauce. Add drained can of pineapple chunks on top. Cover and cook for 2 to 3 hours on HIGH or 4 to 6 hours on LOW. 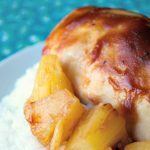 Serve whole chicken breasts with favorite side dish and enjoy! 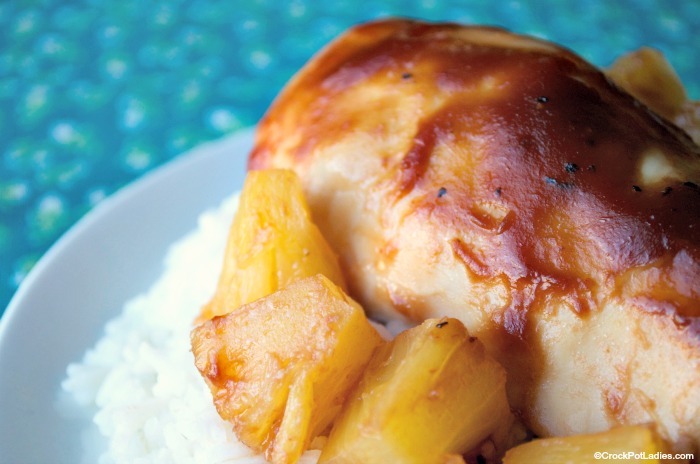 This recipe uses frozen boneless skinless chicken breasts. If all you have is thawed chicken adjust the cooking time by about 1 hour less. So cook instead for 1 to 2 hours on HIGH or 3 to 5 hours on LOW. I used a fresh pork tenderloin roast instead of frozen chicken breasts and it was delicious. Cooked for 4 hrs on High since that was the setting on my crock-pot. Hubby loved it and asked for it to be in our regular rotation of dinners! Could you use an instant pot? How long would you do it for ? 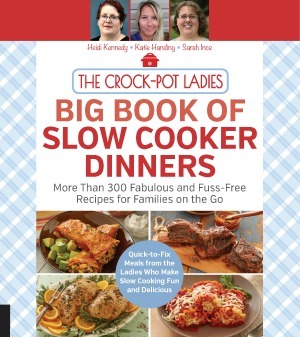 Hi Julie, this recipe has not been tested in an Instant Pot and to be honest I am not sure how long it would cook. If your electric pressure cooker has a chicken setting I would start there. Let us know how it turns out if you give it a try!